Antoine de Saint Exupery was a French writer, famous for the children’s story, The Little Prince which became one of the best selling books ever published. The most striking thing about Saint Exupery’s birthchart is the extremely close opposition between Mars and Jupiter along the central vertical axis of the chart. Mars is right on the Midheaven in Gemini, the sign of writing and communication in the 10th house of career. Jupiter is in Sagittarius the sign of travel at the very bottom of the chart in the 4th house. When a person is widely known for one thing the chart will often contain clear references to that thing. Actors whose working lives have been dominated by one role will frequently have that role described by the symbols in their chart. The famous book is about a young prince who lived on a tiny asteroid but had fallen to Earth and its easy to see the plot in the chart – a journey ( Mars in Gemini ) from high up in space ( very top of the chart ) over vast distance ( Jupiter in Sagittarius ) down to Earth ( bottom of the chart ). Just in case this symbolism isn’t clear enough, Mars and Jupiter both make aspects to two planets, Mercury ( writing ) and the Moon ( youth ) in Leo ( royalty ). The Moon in Leo is The Little Prince and this was confirmed by the fact that it was published in 1943, when the transitting Pluto was conjunct Saint – Exupery’s Moon. Antoine de Saint Exupery’s other great passion was flying and the Mars / Jupiter opposition covers this as well. He began flying in 1921 when Pluto was in conjunction with his Sun. Saint Exupery was also known for two other books, lyrical descriptions of his love of flying, ‘ Night Flight ‘ in 1932 as Pluto was conjunct his Venus and ‘ Wind, Sand and Stars ‘ in 1939 as Pluto joined his Mercury. He died the year after the Little Prince was published and the circumstances of his death were mysterious but entirely appropriate. Saint Exupery left France to go to the US at the end of 1940, to do what he could to encourage America to join the war effort and it was whilst there that he wrote the famous story. Once it was published he returned to France and although 8 years over the age limit for pilots, he persuaded the authorities to approve him for flying operations. He disappeared over the Alps ( again Mars / Jupiter for exceptional height and distance ) in 1944 and was never seen again. 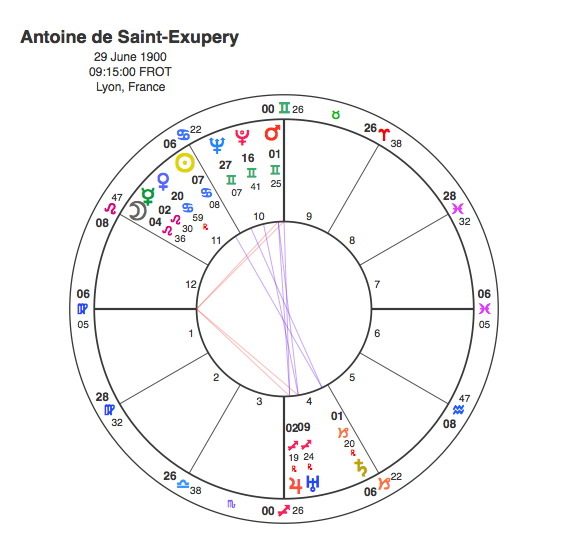 So much of the symbolism in Saint – Exupery’s chart is to do with flying and writing that book and Pluto’s conjunctions by transit neatly describe his journey from his first flight ( Sun ) to writing two books about flight ( Mercury and Venus ) to the Little Prince itself ( Moon in Leo ). After that his life mysteriously ended, it was as if he had already achieved everything that was required of him by his chart.